The K-index above, and by extension the Planetary K-index, are used to characterize the magnitude of geomagnetic storms. Kp is an excellent indicator of disturbances in the Earth's magnetic field and is used by SWPC to decide whether geomagnetic alerts and warnings need to be issued for users who are affected by these disturbances. According to Spaceweather.com Earth has entered a fast-moving stream of solar wind, and this is causing minor G1-class geomagnetic storms around the poles. The solar wind is flowing from a coronal hole in the sun's atmosphere. Earth should be inside the stream for 24 to 36 hours. And regular readers of The Big Wobble will know solar storms and new and full moons are linked to causing seizures and migraines in people and dogs, behaviour problems in children and enhanced medical problems for people in Alaska. 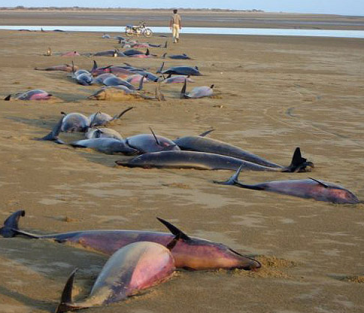 It is a theory The Big Wobble has been banding around for more than a year now, Solar storms may trigger whale strandings as well as dolphins, birds and bees and other animals who rely upon our magnetic field to navigate.